We are all doing very well. 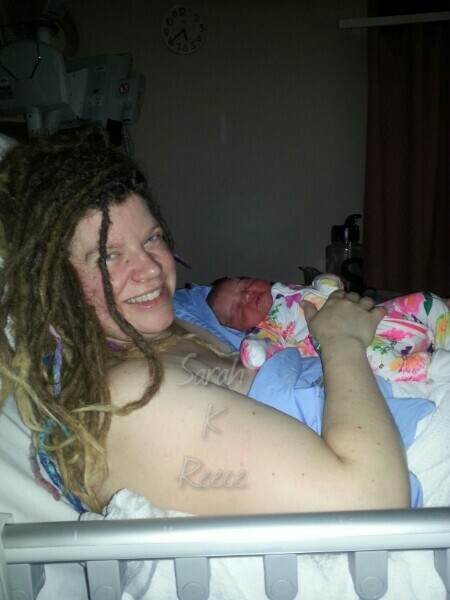 She was born at 7.05am on August 11th. We are still in hospital together as I had a pretty bad tear needing surgery and we’re navigating challenges with incontinence and my pain relief allergies. I have started to be able to walk short distances and we are hoping to be ready for home soon. Little frog is doing brilliantly and in excellent health, and Rose and I are figuring out breastfeeding and our new littlest family member together. Rose has the final say for her name which we haven’t announced yet as we’re still getting to know her and looking for a clearer sense of what it might be. We are dazed, overwhelmed, overjoyed, sore, bursting with love, full of grief for the other little ones not here, missing home and Star and sleep, anxious, content, and profoundly in love. I have been in a surreal bubble since labour and only this morning ventured out of my room for the first time and had the startling sense of being connected to the rest of the world again by doors and corridors and roads. We are incredibly busy learning and managing all these needs, finding a quiet moment for each other, to kiss or talk or touch base is difficult. Talking to the outside world is like sending morse code in a storm, all unpredictable and chopped up. Heartfelt congratulations to you on the birth of this precious girl.